This is one of my favorite times of the year. Everywhere we go flowers and trees are blooming, the fashion industry is breaking out the bright, fresh colors, and the weather is warming up. To help celebrate the season and blessed holiday, here are my top 5 picks. All throughout the year, but especially during holy times, many of us turn to our Bibles for daily study and weekend services. Sometimes, however, taking your entire Bible with you may not be a very practical option. Searching for a good comprehensive app to use on my phone, I came across Daily Bible. I really enjoy it because not only does it have the entire Bible, but it also offers daily verses, reading plans, quick search options, and even devotionals. 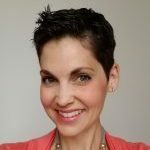 This app works great for me to use when I am waiting for an appointment or need a quick note of encouragement over lunch. The devotionals are all audio podcasts making them perfect to listen to during a commute, while cleaning the house, or if you are out for a jog. The written sections also offer several versions to choose from (King James, English Standard, New International, etc. ), and can be played through an audio rendering if you prefer. Daily Bible is available for free on the Andriod platform. If you are an iOS user there are also several Bible apps on the market. Bible! by Logos is one of the highest rated, free options at this time. It allows you to highlight and note passages unlike Daily Bible; but this one does not offer the extra podcasts. If neither of these are exactly what you are looking for with just a little searching you will find a vast array of applications to enhance your studies and have the Word at your fingertips wherever you go. It just wouldn’t be Easter without Cadbury . Here in the states, we can only find their delectable Creme Eggs in the spring, making them all that much more desirable. No other candy compares to the rich chocolate shell, filled with smooth, creamy goodness. I remember eating my first one as a child and being very hesitant, almost turned off by the “yolk” in the center. But after one taste, I was sold for life. 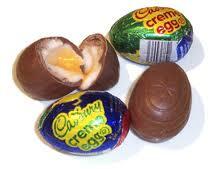 It’s probably a good thing they are only around during Easter, otherwise I’m sure I would consume far too many. The one bad thing about a Cadbury egg, you cannot eat part now and try to reserve the rest for later, it just doesn’t work (not that I would have the will power to do that anyway). The brightly-colored foil wrappers always bring a smile to my face and are some of the first heralds of spring when I see a box near the register. Bringing back the memories of childhood, one is never too old for Cadbury. Indulge a little and stock up now before they are gone until next year. Beloved author and illustrator, Beatrix Potter’s artistry has touched the lives of children for over a century. She is one of my favorite writers, capturing the whimsical world of animated animals and nature. Her watercolor paintings leap off the pages and are perfect for springtime decorations. Many of us when picturing rabbits and ducklings often conjure up memories of her work. As flowers start to bloom and the daffodils emerge, I always find myself with a huge desire to break out her books and be swept away back to the English countryside, reading The Tale of Peter Rabbit, as if for the first time. Moving well beyond the modest books published at the turn of the century, Potter’s characters have grown into an industry of their own. 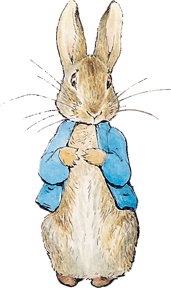 Toys, clothing, nursery murals, apps, books, and even a movie titled Miss Potter have proved that Peter Rabbit and his friends are just as adored today as they were over one hundred years ago. We look forward to sharing the world of Beatrix Potter with our children and generations to come. 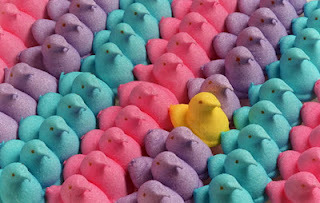 It can be argued that no other candy has quite the devoted following that Peeps do. Started back in the early 1950s, the sugar-coated, marshmallow chicks have been a staple item in Easter baskets ever since. Despite being around for decades, the original recipe has not changed that much; a few variations here and there, but for the most part Peeps today are basically the same Peeps your parents and grandparents enjoyed. They have introduced a few new styles to cater to other holidays, as well as sugar-free options to ensure everyone can enjoy this Easter classic. The latest improvement, however, has been much anticipated; chocolate covered and chocolate dipped chicks, the newest ones are also mousse flavored to satisfy even the biggest chocoholics. The love for Peeps does not stop there; fanatics now compete in creating artwork, recipes, and crafts using the marshmallow figures. Whether you are enjoying them straight out of the box on Easter morning, making s’mores, or designing your very own topiary, make sure Peeps are part of your Easter weekend. Of course we couldn’t talk about the top Easter items without mentioning eggs. Decorating and dyeing Easter eggs for us was not only a family tradition but a time of creativity and genuine art. Most years we started out dipping the eggs into good old Paas dye or a little vinegar, water, and food coloring. Drawing on the eggs with a wax crayon before dyeing produced wonderful results, as well. Of course, it doesn’t take much to impress a child; but as we got older we started experimenting with new ideas using paints, markers, glitter, even tie-dye. Too precious to eat or throw away, we often took the time to pierce and blow out the eggs to keep the shells as long as possible. Before the time of artificial coloring and substances though, people had to use natural ingredients to color eggs. 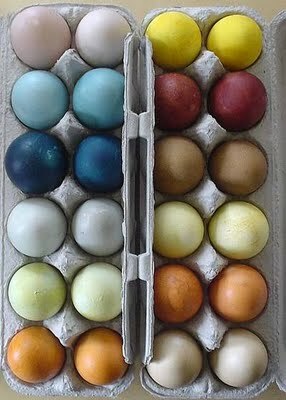 I remember my grandmother telling me about dyeing eggs in coffee just to add some color to the shells and surprise her siblings. Natural pigments such as coffee and tea have been used for centuries as dyes for all types of materials. Exploring this time-tested tradition, Two Men and a Little Farm have taken natural egg dyeing to a whole new level. Their color charts consist of items like grape juice, orange peels, carrots, pomegranates, and parsley. As shown in the picture, the colors these ingredients are able to produce are amazingly vibrant and rich. I’m sure by now your mind is swimming with great ideas, and if you need some inspiration just check out the web. Unleash your creativity and brighten up your baskets by taking the time to dye some eggs, you’ll be happy you did. I’d love to see your celebrations. Feel free to send me your ideas or photos of springtime fun at your house. Have a very happy and blessed Easter!